If It Takes a Scandal is the fourth and final romance in the Marriage by Bargain series. If you like 19th century settings, stubborn but lovable characters, and second chances at happiness, then you’ll love Ruth Ann Nordin’s marital tale. Lord Corin durrant is caught in the den with Candace he is not dressed so they end up married but she says she I'll never marry .her first husband Ian was evil.first 10 months they live in different home then Celia decides to change that with her friend husbands and kidnap her and take her to corins country home and leave her there with him for 3 months things work out for the best.i need to know what Mr Danvers is hiding . 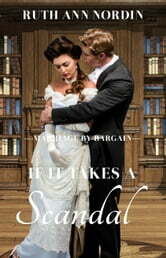 If It Takes A Scandal by Ruth Ann Nordin is a fabulous historical romance. Ms. Nordin has delivered a well-written book. Due to the actions of others, Corin and Candace are thrown into a scandal and forced to marry. Their story is loaded with action, suspense, humor, spice and drama. The characters in this book are phenomenal and perfect for this story. I enjoyed reading If It Takes A Scandal and look forward to reading more from Ruth Ann Nordin soon. 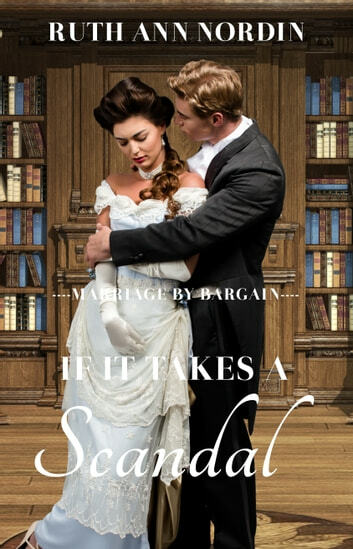 If It Takes A Scandal is book 4 of the Marriage by Bargain Series but can be read as a standalone. This is a complete book, not a cliff-hanger.